As an official Damnling – a term of endearment awarded by the authors of the fantastic horror collective Pen of the Damned – I jumped at the chance to read one of the founders’ more meatier pieces. I regularly sip from their glass of fear, reveling in their uneasy tales, shivers often freshen my blood, monsters invigorate my psyche. Theirs is a beautiful mixed bag of horror. My sweet bedtime stories flash under torch lit chins, curtains blow in midnight’s chill and I have to check under my bed often for nightmares hide easily under mattresses. 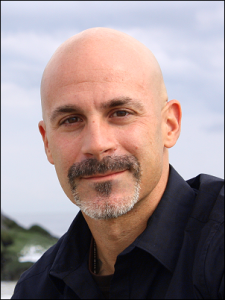 Joseph A Pinto has the gift of the dark but there also lurks a soft, sensitive soul – his pen a powerful balm. So how did your eclectic band of blood misfits evolve? J:Pen of the Damned evolved from a simple dilemma and subsequent solution: in the writing industry, it’s hard enough to brand and market yourself alone, so why not strength in numbers? Along with Nina D’Arcangela and I, we’ve scoured the fringes of the dark realms for diverse voices. Pen of the Damned eventually became an exclusive, eclectic group of ten writers from varying backgrounds. Our goal is to provide readers with free weekly horror and dark prose while developing a platform for ourselves as writers, in addition to our group as a whole. A: I also admire Nina’s work very much, it sounds like a simple and effective way to introduce readers to some great storytellers. I was so pleased I found your book, Dusk and Summer. I shivered many times reading your words, but for different reasons, a different horror. One reason was the veiled sensations only exquisite writing can conjure. The second, finding a book full of magic, myth and dreams, a search for solace when the real life monster of pancreatic cancer takes over your life. In this particular case it was your fathers. One thing paramount in your novella is the love and respect you have for him. You paint a picture of a very strong man, physically and emotionally. Did he impart his imagination to you as a child, a similar mythological tale that we find in the book or did that come later? JP: Thank you Abbie and yes, pancreatic cancer is a monster in its own right, something all too real. My father did not impart his imagination to me but rather his vision; he managed to see things in a different light. Mostly, he imparted his drive. He was a very focused man, and whatever he set out to do, he simply did. He possessed a desire to continually challenge himself and that carried over to many aspects of my own life. I found my strength and confidence simply by watching him. A: So he instilled that by example, and you feel his strength and guidance all through the book and something you touch on with that beautiful quote by Clarence Budington Kellard- “he didn’t tell me how to live, he lived and let me watch him do it”. Was your father a good storyteller? JP: My father was actually MacGyver! lol He could fix anything, make anything, craft anything with a piece of gum, a piece of string and a paperclip. My dad was a mechanical genius but remained low key about it. Honestly, he wasn’t much of a storyteller. He did, however, read horror novels all the time and because of that, he introduced me to the genre I love. A: Dusk and Summer’s words are a siren’s call, a fairytale for sailors and lovers of the sea, a homage. Your father battled hard, peacefully succumbing to the waves. Did you start writing this book during those years of his illness or later? JP: I wrote Dusk and Summer several months after his death. I had no way to process my grief. I was completely lost. Unable to reach out. Eventually I could think of only one thing: write for him. So I sat down, and I did just that. A: It must have felt like it was entering you from another place. I really loved the father and son relationship and I was taken aback by the impact it had on me. For me, it mirrored the father and daughter relationship that I had. To watch someone who was once so strong, invincible in your eye’s grow weaker by the day, so your book was quite cathartic for me. You walk through similar territory, the illness might be different, but the effect that has on those who have to watch by helpless, is no doubt the same. Something I wanted to touch on is how you talk about withholding your emotions, how everyone tiptoes around death so uncomfortably, how everyone is too scared to say goodbye. JP: I had no choice but to withhold my emotions while my father battled pancreatic cancer. It became instinctive. My father was fully aware of the grim survival statistics when it came to the disease. He told me he had no desire to die. As a human being, as a son, how do you respond? You push on and become strong for that person. I never said goodbye to my father. I told him that I would see him later. It stands as a huge difference for me. A: Well you do see them later, in memories, dreams and faces all around you, you see them in yourself. I found a real gentleness reading your work that I didn’t expect to find. Honestly, I didn’t know what to expect. The stories I have read on your Pen Of The Damned are dark tales indeed, but this is more heart wrenching and opposite emotionally. JP: My horror prose, along with some of my poetry, is generally dark and full of angst. But I do write tender pieces in order to provide myself with some balance. At my core, I am a very emotive writer. Dusk and Summer, while part fantasy, part truth, part tribute, is all heart and soul. It’s a story derived from some common threads we all share: how do we grieve, what do we do with our grief, and what belief or faith do we rely on to get us through. A: Loss cripples us. When your dad was at his weakest I’m sure you saw the father son roles shift, you have no choice then to take charge, to show your father this while he was getting to the end of his life was probably proof to him that you have the “never give up” attributes, the strength to survive the grief of it all. “Grown men don’t show fear, they never panic, remember what I always say…” that’s what your father taught you. But there is ‘no morphine drip for the pain of grief’, writing this story is a wonderful therapy don’t you think? 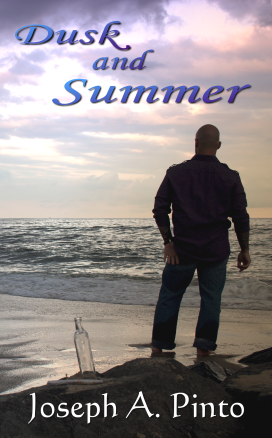 JP: Writing Dusk and Summer allowed me to recognize the extent to which I had my grief bottled. It definitely became my therapy; in many ways, I think it saved me. A: When I read Dusk and Summer, I had thoughts of what my heaven would look like. I think the heaven you chose for your father is perfect. You write about love, family, protection, fear and how we cope with death. If I was going through what you were going through, I think reading Dusk and Summer would give me a lot of comfort, was that an intention of your book also? JP: I wrote Dusk and Summer personally for my father; our everlasting connection. I took real elements of his life and transformed it into a fantasy tribute, as I mentioned earlier. Once I completed it and read my initial draft for the very first time, I was stunned at how raw and emotional my story was. Quite frankly, I bled myself into it. I realized I had crafted a memorial in the guise of fiction. I had immortalized my father. But more importantly, I realized my book could eventually be used for a greater good – raising awareness and funding for pancreatic cancer research, as well providing a level of comfort for others. A: Well I would definitely recommend it as one. Yes, I must mention the fantasy element, it was so beautiful, a place that was a much needed respite between your anguish, it guides the story perfectly your search to find peace for your father. Your adrenalin kicks in immediately in this book, you feel your grief, heart pounding, the intensity of storytelling never stops, that’s why one can’t stop reading Dusk and Summer when you start. JP: Thank you very much. As a writer, you always need to connect with your reader on an emotional level. I draw you into my novella from its opening line. JP: You touched on something there, Abbie. There exists a key element to Dusk and Summer; my character agonizes over writing his father’s eulogy, as did I. I wanted to do so while I still had a clear head but feared if I did, it would mean I gave up on my dad. I would never do such a thing. I cried to my best friend, told him how it was killing me, and he simply said, ‘Joe, I’ve known you for a long time, and I know you’ll know when the time is right.’ When I did finally write my father’s eulogy, I sat at an open window in the month of June, in summer, and watched the dying light of dusk. I felt a connection. I couldn’t explain it then, nor can I explain it now. The next morning, I awoke and spent an hour in bed visualizing my Dad running on the beach. He was whole again. Shortly thereafter, I got the call from the hospital that he had passed, and I realized it probably happened during the time I spent visualizing. So yes, I believe a connection had been made. Hence my title, Dusk and Summer. A: Joe is currently working on a new blog to launch soon for the pancan community. It will be a place for people to write and share tributes about their own loved ones, share articles of awareness as well updates on breakthroughs in the medical field, fundraising news from groups, all the while promoting positivity and hope. A: So Joe, I have to ask, do you really believe in Mermaids? JP: Do I believe in Mermaids? Interesting question. Yes, of course I do. With faith, anything is possible. With belief, anything becomes real. Thank you for having me aboard, Abbie. Your support is dearly appreciated! A portion of the proceeds from the sales of Joe’s book will be donated to the Lustgarten Foundation for Pancreatic Cancer research. This organisation promotes the advancement of scientific and medical research related to diagnosis, treatment, cure and prevention of pancreatic cancer. Joe is an avid supporter. By purchasing Dusk and Summer, you will be supporting a wonderful cause and a brilliant storyteller. You can find Joe’s tortured tales and compelling poetry on his website: josephpinto.com You can also link up with him on twitter @JosephAPinto, @penofthedamned and facebook. If you want more information on pancreatic cancer or The Lustgarten Foundation go to http://www.lustgarten.org/.